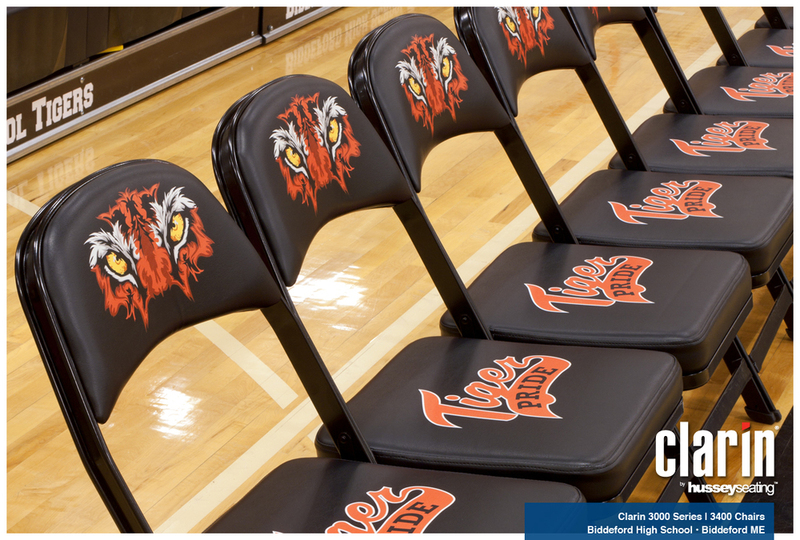 A popular choice among facility managers and coaches for athletic team sideline seating and locker room seating, the 3000 Series portable folding chairs offer advanced comfort with a 3” (76 mm) upholstered seat and 1” (25 mm) upholstered seat back. 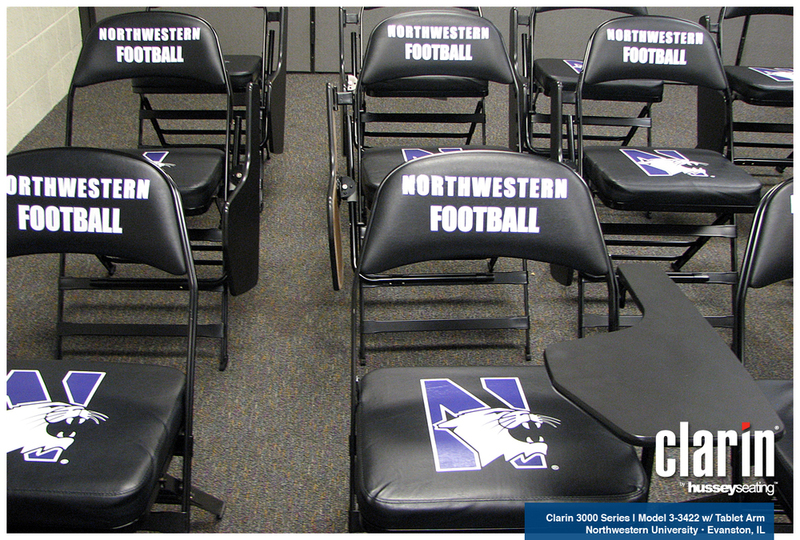 Add a printed or embroidered logo to the seat, seat back, and seat gusset to show school spirit or corporate support. The 3000 Series portable folding chair is also great for extra seating in any location. Designed for comfort, the model 3400 has a thick seat cushion and comes with your choice of upholstery. Upgrade to a contour molded foam seat for advanced user comfort. Also available in a 1 ½” (38 mm) wider seat to give users extra personal space. Designed for heavy use and heavier loads, the model 3400HD Heavy Duty Titan has extra stretchers, X-FRAME reinforcements and a modified seat frame for everyday typical use by a 350 lb. user. Also available in a 1 ½” (38 mm) wider seat to give users extra personal space. A 1 ½” (38 mm) wider seat gives users extra personal space with thick seat cushion and your choice of upholstery. Clarin 3400 Series Sideline chairs. Perfect for team seating, the 3400 is the standard in sideline seating. Clarin 3000 Series Model 3-3400 folding locker room chairs. 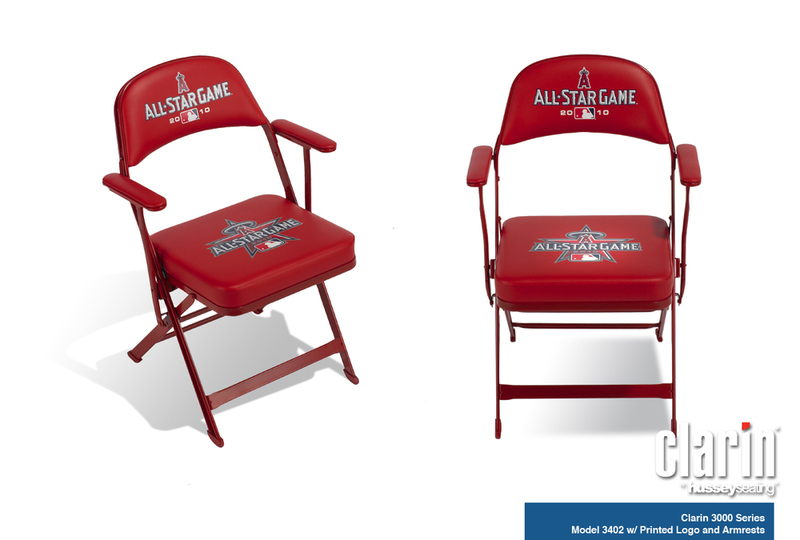 Features: wide seat for added comfort, embroidered logo. These 3400 chairs are the definition of school pride! 5-color backs and 2-color seats make this chair the envy of any visiting team. The 3400 is a perfect choice for team seating or VIP front row seating. 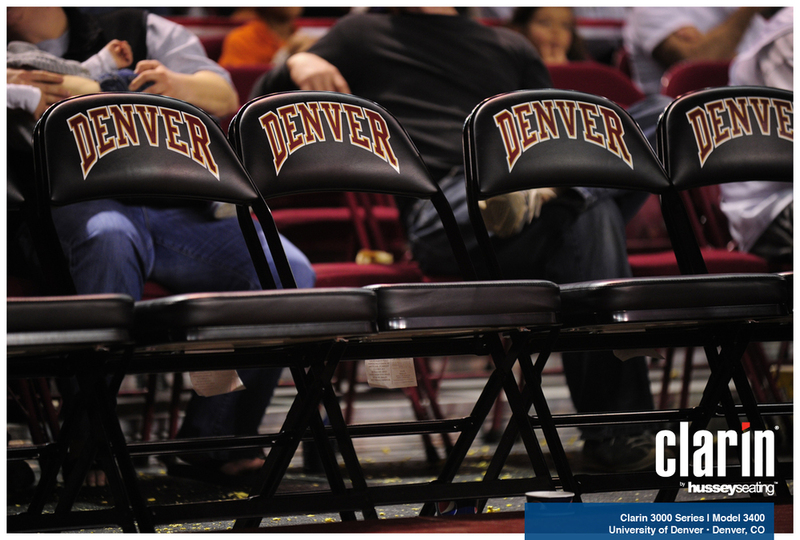 Clarin 3000 Series Model 3400 portable folding courtside team bench chairs. Features: printed seat and back logos. Clarin 3000 Series, Model 3400HD Heavy Duty Titan portable folding locker room chairs. Features: Extended leg reinforcements, extra leg stretchers, modified seat frames and hinge reinforcements for heavier loads, printed logo. Clarin 3000 Series, Model 3400HDTA Heavy Duty Titan with tablet arms. Features: Extended leg reinforcements, extra leg stretchers, modified seat frame and hinge reinforcements for heavier loads, printed seat back and seat logo, fold down tablet arm. Featuring Clarin 3000 Series portable folding chair models.